You are currently browsing the tag archive for the ‘Parks’ tag. Visitors to Jefferson Memorial Forest often pass through Fairdale. On their blog, Louisville Metro Parks say the city is trying to make Fairdale more accessible by pedestrians and cyclists, and to encourage the growth of retail and dining for visitors. There’s also a new library coming to the area. The Parks blog says the improvements are designed to “help Fairdale retain its rural character and make the area more attractive and easier to navigate for visitors.” How will this be done? Residents are welcome to sound off. The department says public input will be sought on parks-related changes to the Fairdale Area, and updates will be announced on their website. To hasten the design and build of a new interchange at Manslick Road at Watterson Expressway. This expansion will help save lives by dramatically cutting the commute time for emergency vehicles to reach Louisville’s second busiest emergency room at Sts. Mary and Elizabeth Hospital. It will also attract physicians’ offices to the area and provide the neighboring communities with a shorter commute to I-264, saving time and money while reducing carbon emissions. We believe that our schools are the anchor of our community. If Southwest Louisville is to reach its full potential, then Southwest Louisvillians must play an active role in providing solutions that will engage and refocus the our area schools toward complete success. The SWDT will form a “task force” that will work directly with Jefferson County Public School officials, faculty and parents to formulate a strategic plan to effect positive results for the educational well being of our students and families. Southwest Louisville is rich in history and unrivaled in culture and natural beauty. Our vision includes that of a fantastic 20-mile “River and Knobs” greenway, extending from Jefferson Memorial Forest. It would connect to other Southwest treasurers such as Iroquois Park and the greater community network of parkways, bikeways and enhanced transportation corridors. Fredrick Law Olmstead would certainly be proud of our achievement. The Federal Government, through an 850 million dollar investment is transforming our neighbor, Fort Knox, into an economic bonanza. Thousands of military and civilian workers will soon descend upon the area looking for a place to live, shop and play. The SWDT realizes the potential of Dixie Highway as an “economic connector of development” that could bring sustainable growth to Southwest Louisville for many years to come. We seek to aggressively market Southwest Louisville as the “Corridor of Opportunity”. The bush honeysuckle is growing in JMF, and as the Metro Parks blog explains, it’s causing problems. Preferring full sun, they tend to favor forest edges, disturbed areas, old agricultural fields, abandoned railroad right of ways and roadside edges. Honeysuckles are extremely adaptable to many different climates and soils, especially calcareous soils. Their vigorous growth can in part be attributed to the lack of natural biological controls such as herbivores, insects and diseases. Eventually they will spread throughout the forest, completely dominating the lower canopy. One study indicated that the rate of spread can be as much as a half-mile per year. The thick, often impenetrable, cover shades out native species and inhibits forest regeneration. Fortunately, the seeds have low embryo viability and last as little as two years in the seed bank. There has been some evidence of alleopathy which curbs seed germination and seedling growth to some species. In addition, the extensive shallow root system out-competes native flora for nutrients and soil moisture. Not only does honeysuckle reduce forest diversity, but the native plant community has been diminished, causing loss of native habitat and food sources for the forest creatures. The early leaf out and late leaf drop extend the photosynthetic period, contributing to its own growth and decreasing available light to the native plant community. Studies have shown that this extended foliage time has birds nesting earlier and staying later. Birds also tend to nest lower in the arching branches, which leaves them vulnerable to forest predators. Google “bush honeysuckle” and one will find more information than one needs to know. At the forest, Bush Honeysuckle can be found nearly everywhere. Last week, Mayor Jerry Abramson and Olmstead Parks Conservancy officials announced a $150,000 fundraising push to fight invasive species in the parks. The invasive species began to flourish after the 1974 tornado, and now alien vines are choking many trees. After the press conference, I talked with Olmstead Parks Conservancy Restoration Manager Robert Woodford. Woodford is part of the team that removes the invasive species from the parks. Metro Councilman Doug Hawkins sent out this press release in reaction to the mayor’s work with the Olmsted Parks Conservancy. Abramson finds $5 million for Parks by his house. Otter Creek Park remains closed, fate still uncertain. Abramson spoke at the conservancy’s announcement today, but it wasn’t about $5 million being found. The conservancy’s capital campaign is $150,000 from its five-year, $5 million goal. If they reach the goal by June 1st, then the James Graham Brown Foundation will give them an additional $900,000. The money came from donations and is used to fight invasive species. The conservancy did the work on this one, but what do you think of Hawkins’ point about a lack of focus on Otter Creek Park? 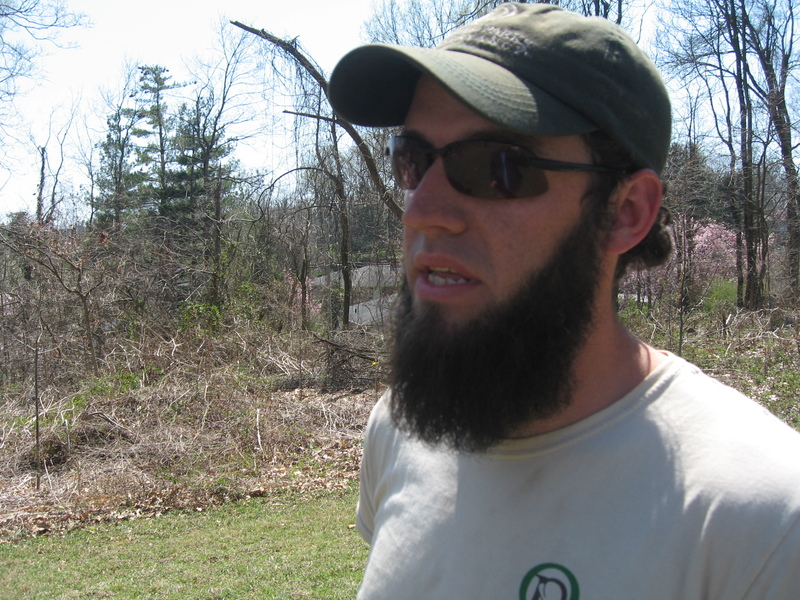 I interviewed someone once who was involved in the Save Otter Creek Park campaign. He said the group had a lot of energy, but eventually fell apart due to a lack of participation. The Olmsted Conservancy is a focused group (founded in part by Abramson) that works for the Olmsted parks. Does Otter Creek Park need a conservancy? There are no immediate plans to remove the teepee, nor is funding being sought for such an effort. If funding is someday in place for this, approval to remove and replace the structure would trigger another public review and opportunity for public comment at that time. No new parking is proposed at the current location of the teepee. In fact, there would be no net increase in parking space in this area of the park. Master plan recommendations can evolve over time, based on changing community priorities, new information, cost limitations, etc. To that end, additional feedback is always welcome at parks@louisvilleky.gov and info@olmstedparks.org. The teepee structure is not in great shape. An estimate prepared by the Olmsted Parks Conservancy found that repairing the roof alone would cost at least $150,000 – about the cost of building a new shelter. Over the long-term, replacing the shelter would be more cost-effective. The Olmsted Parks philosophy of “restore, enhance and preserve” has gradually implemented removal of elements that are inconsistent with the Olmsted design intent and replaced them with facilities and structures that are consistent with that design intent. With the new development plan for the Floyds Fork greenway in place, the stage is set for work on two parks in the area. I wrote about the plan yesterday, and today, in two separate conversations, two issues came up. I want to bring them here for a discussion. 1. Parks can attract commercial and residential development. How should this be governed in Floyds Fork? 2. Should public money be spent on parks that are hard, if not impossible, to reach by public transportation? It’s hard for people to get to Floyds Fork if they don’t drive, but how should this be balanced with serving taxpayers who live in the area? For some reason, owls are hip right now. Seriously, go to WHY! Louisville; there’s a lot of owl gear on display. I was given a gift last month wrapped in owl wrapping paper. But if it’s real owls you’re interested in, Raptor Rehabilitation is bringing some to Jefferson Memorial Forest. A variety of owls, native to Kentucky, will be on hand as ambassadors of their species. Raptor Rehabilitation of Kentucky is bringing these amazing owls to share exciting facts. You will get the chance to see these birds up close and hear them. Of course, some owls are more vocal than others. The event is February 5th at the forest. More information can be found on their blog. Mayor Jerry Abramson outlined his ideas for how Louisville’s parks will look in 2015 in his State of the City address last week. Here is Metro Parks’ reaction to the speech. Those are some of the park improvements we’re dreaming about. Some of those the city can make happen, while others will require private funding or innovative partnerships. Schedules will be determined, in part, by the pace of economic recovery. Once you finish digging yourself out of the snow, you can go to one of the city’s parks to sled. Here’s the information from Metro Parks. Metro Parks wants to remind the public it will open hills in seven parks for sledding from 9 a.m. to 11 p.m. on days when snow accumulation reaches 2-3 inches. When snowfall occurs, Metro Parks employees will visit designated sledding hills to post an “open” or “closed” sign, depending on snow coverage at each location. As long as the sledding hills maintain adequate snow coverage, they will remain open. Park users are asked to avoid sledding when hills are closed. Sledding on slopes that lack appropriate snow depth will cause costly turf damage that must be repaired in the spring. *This is just a joke, there’s no blizzard on the radar.